As you enter downtown Galena, you find a mining boomtown perfectly untouched by age since its mid-nineteenth century heyday. Old homes and buildings have been meticulously preserved, and much of Galena today is listed in the National Register of Historic Places. Tourism is now the city's main attraction, with specialty shops, boutiques, galleries and restaurants appealing to the more than a million visitors annually. And nearby, you'll find ample outdoor activities at Apple River Canyon State Park, four challenging world-class golf courses, equestrian trails and even some downhill ski runs. WorldMark Galena is situated near Eagle Ridge Resort's General, the most challenging of the four world-class Galena territory golf courses. Each unit includes a fireplace, cable TV, dining area and a deck. One- and two-bedroom units include fully equipped kitchens. 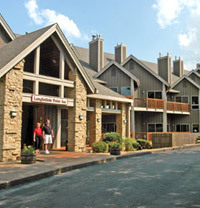 The resort features a glassed-in indoor pool, hot tub and game room.